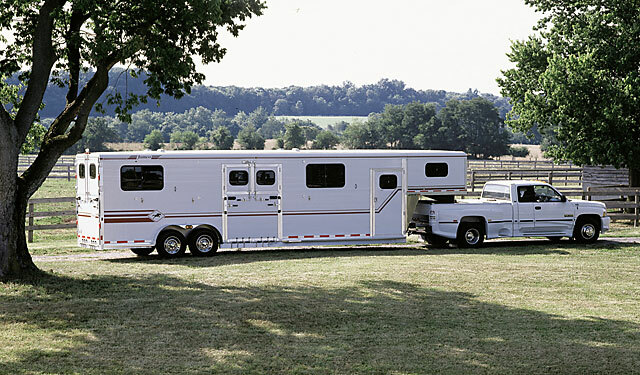 The absolute ultimate in straight-load trailers, the all-aluminum Competitor is fully custom, with an amazing number of options for both riding and driving horses. With Jamcos QuickChange post and divider system, these trailers may be changed from day to day to a multitude of configurations, depending on the size you choose. For example, the six horse Competitor III with optional box stall dividers may be configured with up to three horses in the front, and a vehicle (an ATV, golf cart, etc.) in the back which can then become a cross tie area or box stall upon arrival. The Competitor allows for a choice of width, height and length, and carries a seven year frame warranty and twenty year pro-rated warranty on plank walls.